As a general rule, dingoes are not considered to be a 'safe' animal to encounter. Dingoes are generally a non-aggressive species, but have been known to attack humans, pets and livestock. While they are naturally wary and timid around people and will more often than not run away if they sense people approaching, there have been recorded negative interactions between this wild dog species and humans. Dingoes are an opportunistic predator and should be regarded with caution. If they have become habituated to humans, they are considered to be even more dangerous. If they associate humans with food from either being fed by them in the past or from scavenging from their rubbish or campsites, they are often more willing to approach people which can cause negative effects. While they may look like a household dog, they are far from it. While rare, dingoes have been known to attack humans, often resulting in injury. More often than not, human and dingo conflict occurs when they hunt livestock such as sheep or small cattle. Dingoes have had to be euthanized on Fraser Island in the past after they have had dangerous encounters with humans. This often happens after people have fed them or encouraged them in some way by means of food and they begin to associate people with food. 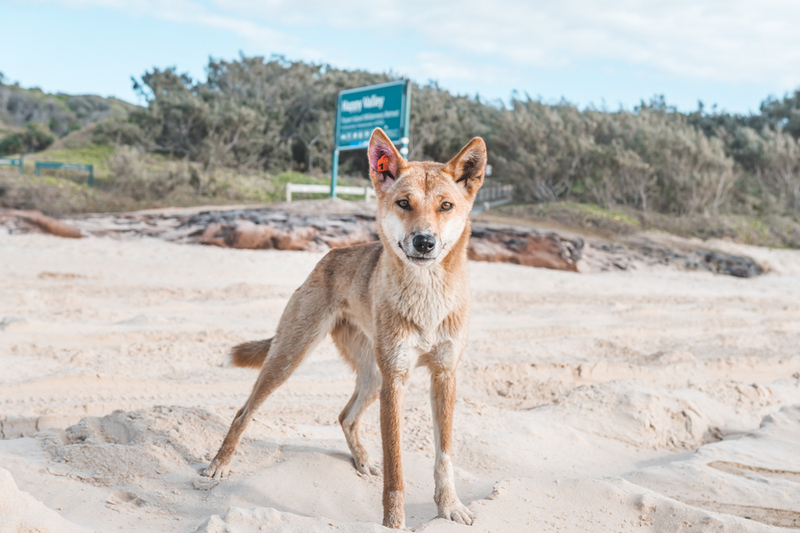 The best way to keep Fraser Island dingo safe is to always maintain your distance, never feed the wildlife (especially the dingoes) and to give the wildlife the respect it deserves. What to do if you see a dingo? What do dingoes eat on Fraser Island? How many dingoes are left on Fraser Island?